Read Article: "Birth of the Ccara Registry"
Welcome to the Ccara llama web site hosted by the North American Ccara Association (NACA). 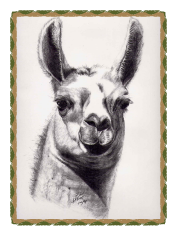 Our mission is to seek out, preserve, perpetuate and promote the best specimens of the working llama-the Ccara. This registry for the Ccara llama has been established for the working llama. In cooperation with the ILR the North American Ccara Association (NACA) has been established as a formal recording program for the Ccara llama using strict screening criteria. There are distinct relationships between conformation characteristics and athletic ability which will be sought out in our screening criteria. There are a number of different body styles that are suitable as working animals. The Ccara Llama Registry will include all these different phenotypes as long as they meet our structural criteria as balanced, athletic, Ccara llamas. It will remain up to the individual breeder to select from these potentially good animals and use the best for breeding. With sound breeding programs blood lines will produce offspring with a high success rate as working animals. The desirable characteristics of the Ccara and screening criteria are described in other sections of this site with skeletal drawings, pictures and text. Ccara photo credit to Martin Chambi from Cusco, Peru, circa 1940. New Press Release ---What is a Ccara?